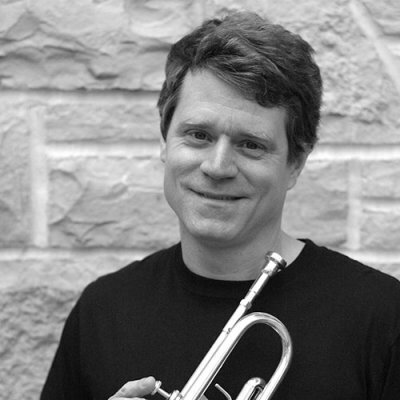 Martin Hodel is Associate Professor of Music at St. Olaf College in Northfield (Minn.) where for the past 17 years he has taught applied trumpet, chamber music, and conducted the Philharmonia Orchestra. He has performed as a trumpet soloist, chamber musician and orchestral player in the US and around the world, and premiered works by Markus Stockhausen and Daniel Kallman. During the 2005-06 season he played full time with the Minnesota Orchestra. As Principal and Solo Trumpet with the Eastman Wind Ensemble, Marty toured the US and Japan, and coast to coast with the Dallas Brass. He has also shared the stage with jazz artists Joe Henderson, Maria Schneider, Slide Hampton, Claudio Roditi, David Murray, and Jimmy Heath, and has toured and recorded in Germany with organist Bradley Lehman (’86). Their CD, In Thee is Gladness, has been critically acclaimed and has its roots at Goshen College. In addition, Marty has soloed with conductor Helmuth Rilling, on public TV, and on the radio programs A Prairie Home Companion, Sing for Joy and Pipedreams. Hodel holds a DMA from the Eastman School of Music, and MM from the University of North Carolina Chapel Hill, and a BA in music education from Goshen College.